The history of royal favourite Kent & Curwen collided abruptly with the 21st century for A/W 2014 with their debut collection by British designer Simon Spurr, one bursting with subtle nods to his experience at houses like Saint Laurent, Calvin Klein and Ralph Lauren. Bridging the no man's land of 'urban heritage', the immaculately finished wardrobe took no risks when it came to silhouette, keeping cuts slim and masculine inspired by naval uniforms. 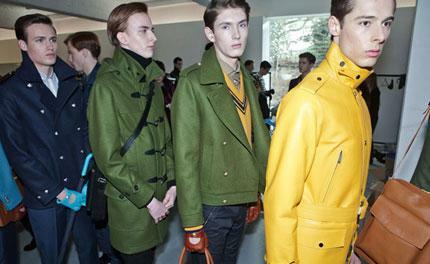 It was in his textural fabrications and colour palette that Spurr flexed his creative muscles - hexagonal quilting and shearling panels adding dimension, while lemon yellow or teal leather popped against the palette of monochromes and khaki.